*Dramatic sigh* Well, I was looking forward to this week’s reveals of new Smash Bros.-related goodness. I really was. I was expecting perhaps another cool character reveal, old or new, and some awesome screenshots. And in return? 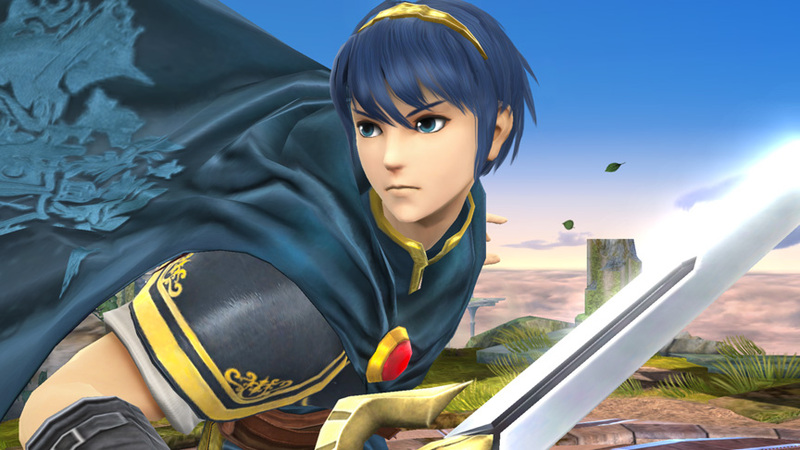 We got the return of Marth. I know there are plenty of fans of the speedy swordsman out there. I, however, am not one of them. I gravitate towards more tricky, annoying characters who play the away game with lots of projectile goodness. So you’ll often see me as Ness, Yoshi or Princess Peach, all of whom are completely dominated by Marth’s inexplicable ability to deflect any and every projectile thrown at him. That, coupled with his insane reach, has made him one of my least favorite foes. Regardless, this week in Smashing Saturdays, we are trying out a new feature. First, I’ll analyze the new screenshots, and at the very end of this article, the new feature will be introduced and written by the very capable Jeff Neuenschwander. Hope you’ll all enjoy it! Monday was a good start. 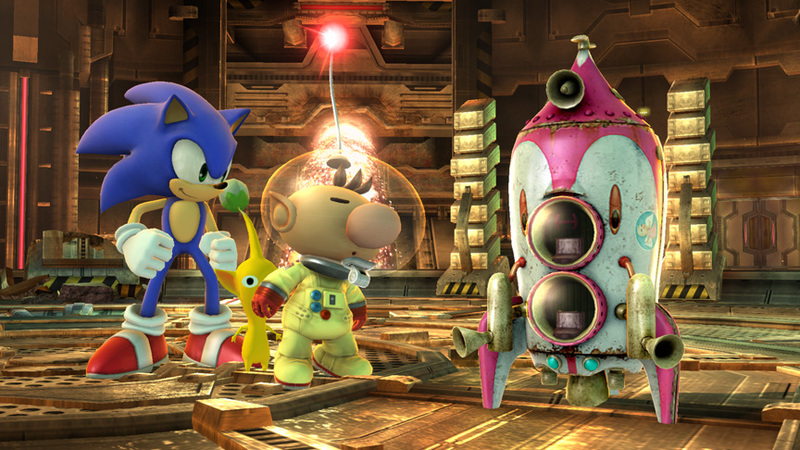 We got this calm picture of Sonic and Olimar staring at his overly destructive Rocket. I appreciated this screenshot for a couple reasons. First, Sonic is contemplative instead of dashing around like a juiced-up rat. 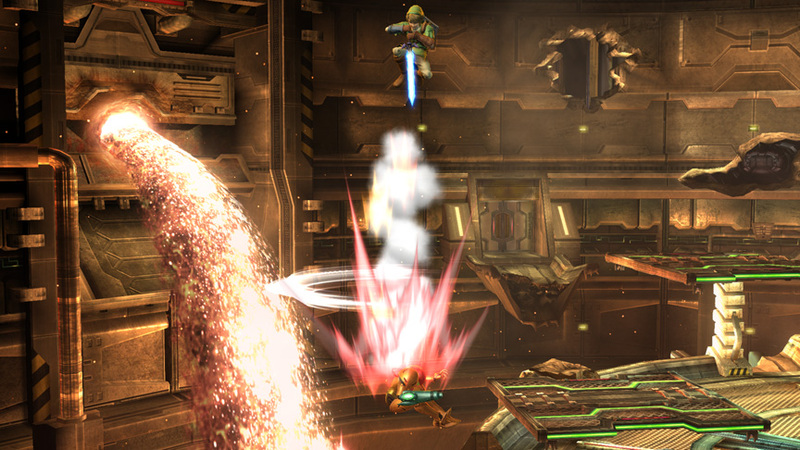 Second, it is proof positive that Olimar’s super-annoying Final Smash is making a return! That was by far my favorite aspect of the tiny spaceman, and I am happy to see it make a triumphant return. Tuesday also offered an interesting image. 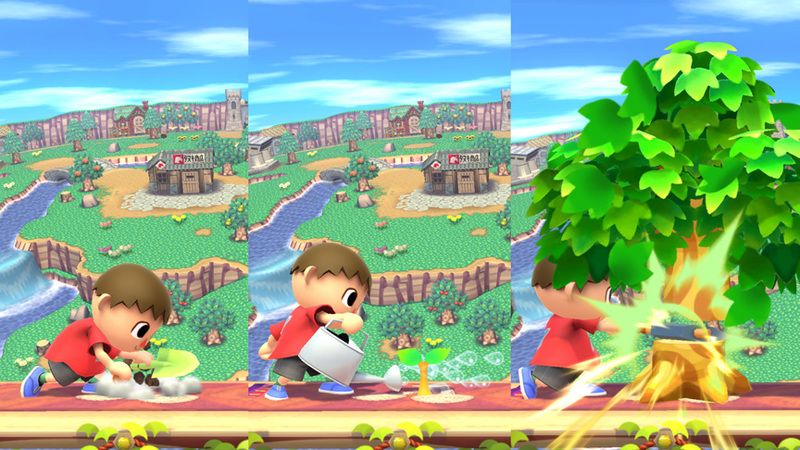 Instead of an action shot, we got a play-by-play of how Villager’s wood-chopping attack animation actually works! Though I’m sure getting hit by a tree hurts, I can’t help but wonder what would happen if this sequence were interrupted by an enemy attack? Would the tree still grow and just not fall over? Either way, it makes Villager an even more compelling new addition to the already great roster. Ouch. I’m sure Wednesday’s screenshot was painful for all you Samus players out there. At the very least, this confirms Link’s Down-A is still as brutal a spike move as ever. I’m also trying to place the background level, which I’m positive is from the Metroid series, but I’m not sure which game. Maybe it’s from Other M? Either way, poor Samus is taking a swim. JEFF: Entering into Melee, I was looking for a character who was agile yet packed a punch and was easy to control. Before then, I had Link, who was slow; Pikachu, who was weak; and Captain Falcon, who was difficult to control. 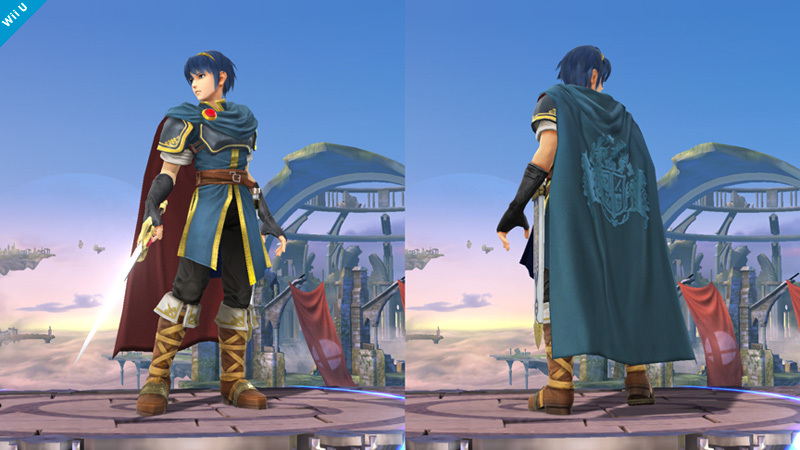 Then, in a battle for a new character, with an upbeat song and a MIDI trumpet riff that seemed like it was pulled straight out of a mariachi band, I was introduced to Marth, my once, current, and future main fighter. And of course, you can’t discount how Marth introduced a number of us to the Fire Emblem series, including me and my little cousins. Together, the three of us have played through Path of Radiance, Radiant Dawn, Sacred Stones, and Shadow Dragon. And I think it’s safe to say his lore and lineage became even more legendary in Awakening in part because of his greatness in the Smash Bros. games. And frankly, Josh, that’s enough to earn the right to be cocky.